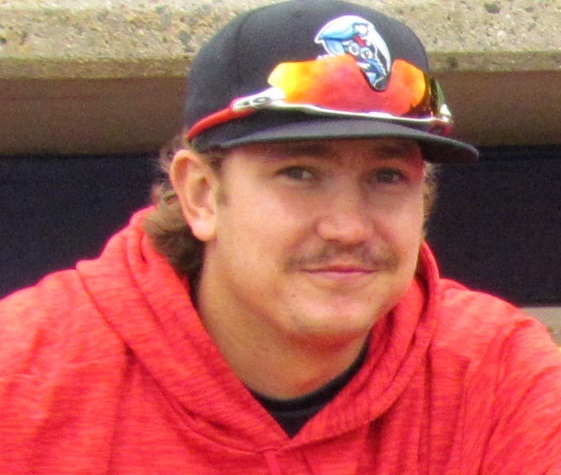 The Lakewood BlueClaws pitching staff has been leading the Class A South Atlantic League in team ERA for several weeks. In 62 contests, the Claws' staff features a 2.62 ERA. Furthermore, the starting rotation has been marvelous, placing four of its six members in the top ten on the league's ERA leaderboard. Left-hander Damon Jones has had a hand in the club's remarkable production. An 18th round draft selection by the Phillies last year out of Washington State, Jones has posted a 4-2 record with a 2.12 ERA, a .223 batting average against and a 9.7 K/9 mark through 10 starts. Recently, I sat down with Jones to talk about his efforts this year, his teammates in the BlueClaws' starting rotation, his pitch repertoire and more. Read on for that full interview. -Talk to me about your impressions of the league and maintaining your tremendous results thus far. It's a really good league. I know we have a great rotation thus far and it's good to be a part of that. My last start was the longest outing I've had in my professional career and including college I never went seven innings, so it's a good thing. I don't know, I really like all the ballparks in this league. It's a great first taste of full-season ball. -Do the parks play favorably to you? Is that the reason for the appeal? I mean, I guess. There's some that have short porches and stuff like that, but for the most part, I'm getting a lot of ground balls, so I'm not really too worried about long balls yet. -Very good. Last month I talked with a couple of the offensive guys on this team and they mentioned they were hoping to do more with the bats, to try to help out and keep up with the outstanding efforts of the pitching staff thus far. But, of course, the defense has been there from those guys. On that side of the game, you obviously have a team behind you helping. Do you feel like you're benefiting a lot from those guys on defense? Yeah, we have a great eight guys behind us pretty much every time we go out. So, a lot of error-free baseball we're playing, so that's really good. It's nice to see a lot of double plays turned, some that aren't routine too. A lot of diving catches in the outfield. A lot of balls getting run down that probably would be doubles. So, it's nice to have them behind us. -Overall, this team is a good unit. I think you guys have a lot of chemistry among the players, but how about the coaches? Is there a good bond with those guys and are they helping you a lot? Yeah, I love the coaching staff a lot. (Pitching coach Brad Bergesen)'s been great. I know it's his first year and everything. He's an awesome guy. I've learned a lot. And I've tried to be my own pitching coach a bit too. He's helped me with that. Because as you move up in your career, you have to be your own pitching coach too and he's kind of helped me with that part of it. (Manager Marty Malloy)'s a great manager. He really pulls for us. He's a big team guy, so it's awesome. -Do you agree with that chemistry observation about the players? Do you feel there's a strong team bond going? Yeah, definitely. We're a really close knit team. -What's your arsenal like? What's your pitch selection and what do you feel is your go-to pitch, if you have one? My fastball's really my main go-to pitch. I've been developing a slider and curve ball. The slider really showed up (in my last outing). The change up's probably my fourth offering and sometimes it shows really well, especially early in the year I threw a lot of good change ups, so I need to find that again, but, yeah, my fastball's usually my go-to. -Where is the velocity? Is it improved from previous seasons? It's probably about the same from last year. I'll throw anywhere from 90 to 95. Last year, I think I hit a 96. But, the fact that it's staying the whole game is a really big step for me, I think. -Were you always a starter through your college tenure? Yeah, I was mostly a starter. I relieved maybe four of five times at Washington State. At junior college I only relieved and then I started in the summer. But, yeah, I got my pitch count up. My command was pretty poor in college. I mean, I always threw pretty hard in college ball, but the command is starting to get better and better, so I'm happy about that. -Were you a three year college guy or did you play four years? I red-shirted my first year, got elbow surgery, played one year of JuCo, then transferred and (pitched) two years at Washington State. -What was the elbow surgery? -Was that a long recovery? It's about half of a Tommy John. -Alright. How do you feel your college years, the ups and downs of the injury time, recovery and all that helped you prepare yourself for pro ball? It helped me to be mentally tough and physically tough. I know what my body can take and I'm probably-- I mean, going through surgeries and stuff, I'm probably tougher than a lot of people think. It just kind of gives a mindset of you can push through anything if you put your mind to it. -Excellent. Who do you room with here with Lakewood? -At one of the levels, somebody was telling me the Phillies or their team was trying to room Americans and Latin guys together. That's not the case here? No, not really. We have a couple guys that translate alright, but mostly, it's just (coach) Milver Reyes, who translates. 'Cause a lot of guys live together, especially on the road too. So, it's nice to try to interact with them and learn the language because there's always going to be Latins in baseball. So, if you can talk to them it helps. -Over last off-season there were some symposiums or camps in Clearwater that had Spanish classes that were mandatory for the American players. Did you attend any of those? I just was at instructs. I didn't go to strength or speed camp. I took four years (of Spanish) in high school. So, I understand it pretty decently. I'm not that good at speaking it, but I've been doing Rosetta Stone trying to learn more of it. -You've got a couple Latino catchers here, so the communication with those guys is key. What can you share about your connections with those guys? Yeah, (Rodolfo) Duran and (Gregori) Rivero, they speak pretty good English, so they understand a lot. So, it's not a bad thing. They don't understand everything, but it's nice when you say something they understand you. I've pitched to both of them. They both pretty good. I know they're both pretty young, but they're showing a lot of upside. -Your rotation mates, everyone's been so solid. Fans that don't get to come out and watch you guys are starting to hear a buzz about what kind of numbers this staff is putting up and what you guys are doing. Talk about this starting rotation here. From top to bottom, one through six we've been really solid all year. I know Spencer (Howard) struggled a little bit, but when he shows his stuff, it's incredible what he can do. He'll be back in the next week or two and he'll show that he was a second rounder for a reason. (Ramon) Rosso's really come out of nowhere, kind of. He showed a lot of good stuff last year in Williamsport and his cutter-slider combo has been devastating this year. Stewart's a ground ball machine, doesn't give 'em up and if he does they're ground balls through the hole, but I've been charting when he pitches sometimes and he gets 15 ground ball outs in a game, it's nuts! "Stretch" is really good. I don't know- he's a very dominating force on the mound, when you see a seven-footer out there. He really places the ball well and has a good off-speed with good change up, curve ball and slider combo. -Stretch, referring to Kyle Young. Is that a widely known nickname? Yeah, he has it on his glove too! And then (David) Parkinson, he's one of the better baseball minds that I've seen, just talking about how he goes through pitch selection and he reads swings and stuff like that. I can pick his brain, 'cause I don't really think about that. Say (a batter) swings through a fastball, he'll know what to throw next. He may not execute it all the time but he has his mind always working. I don't know. He's a really focused guy. -Were there any pitchers or players that you looked up to growing up that you may have wanted to emulate? Randy Johnson was my idol. That's probably it in terms of left-handed pitchers. After high school, I didn't hit in college or anything, but probably just Randy Johnson for the lefties. -Is there anybody with the Phillies you got exposure to, veteran coach or player wise, that you picked up a lot from? I met (Jake) Arrieta a little bit. I wasn't in the conversation, but he was talking to Bergesen and he has a great baseball mind. A lot of guys listen to him for a reason. He's been around the game a lot, had a lot of success recently too. I like listening to Gabe Kapler talk. He talked to us a couple times in spring training. He's very forward and knows what he wants to do and obviously it's showing with the Phillies. He's got a good plan. It started with a slow step at first, but he knows what he's doing. Other than that, not really. I didn't go to any big league games this year.